Now if your university were graced by author J.K. Rowling for your commencement speech, you would be totally honored right? Not the snobs at Harvard. When I heard this NPR story, I was totally flabbergasted. "I think we could have done better," shrugged computer science major Kevin Bombino. 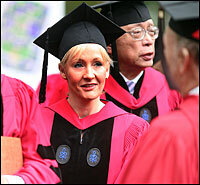 He says Rowling lacks the gravitas a Harvard commencement speaker should have. "You know, we're Harvard. We're like the most prominent national institution. And I think we should be entitled to … we should be able to get anyone. And in my opinion, we're settling here. " You must be joking. Just because Rowling is an extremely successful author of children's books does not mean that she is inferior in any way to a snot-faced prig who knows nothing about being successful in life. Obviously the Harvard alumni who chose Rowling as a commencement speaker knew that she could impart wisdom to this graduating class, but apparently they still have a lot to learn. In her speech, she talked about the benefits of failure, something these silver-spoon ingrates would probably never experience. Entitlement indeed. For that remark, I would never hire a computer scientist from Harvard. Obviously, they made a poor choice in higher learning institutions and learned NOTHING. And they still refer to MIT as the trade school down the river. Hmmph! Success is never achieved by how many people you can put down, but how many people you can influence. Recently I received one of the best compliments from a younger colleague. She was telling me about a job interview where she was interviewed by an MIT graduate with a PhD from Stanford. She said she was really intimidated by his credentials at first but found that he really was the nicest sweetest guy. "Kinda like you," she said. I was really flattered. Sure there are plenty of snobs that come out of MIT, but there are at least two who know a thing about humility and being approachable. So in brain-washing our kids, I really can't say anything bad about their grandfather's alma mater Harvard, but I will continue to push for MIT. And I will always teach them that snobbery will not be tolerated.